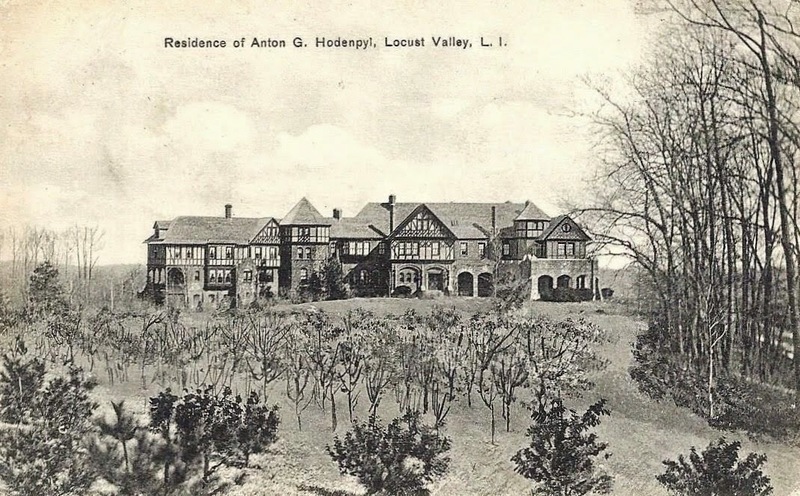 'Hill House', the Anton Gysberti Hodenpyl estate built c. 1900 in Mill Neck with landscaping by Ossian C. Simmonds. Hodenpyl was a partner in the brokerage firm of King, Hodenpyl & Co. and Hodenpyl, Hardy & Co. He was also president of the Commonwealth Power, Railway & Light Co., Michigan Light Co., Union Railway, Gas & Electric Co., and numerous other power and rail companies in the midwest. Hodenpyl died in 1933 and his wife in 1935. In 1938 the estate was sold to a William Simpson and 'Hill House' was demolished c. 1940. So this house lasted all of 40 years & not much after the builders passed. Any knowledge of what William Simpson put in its place?